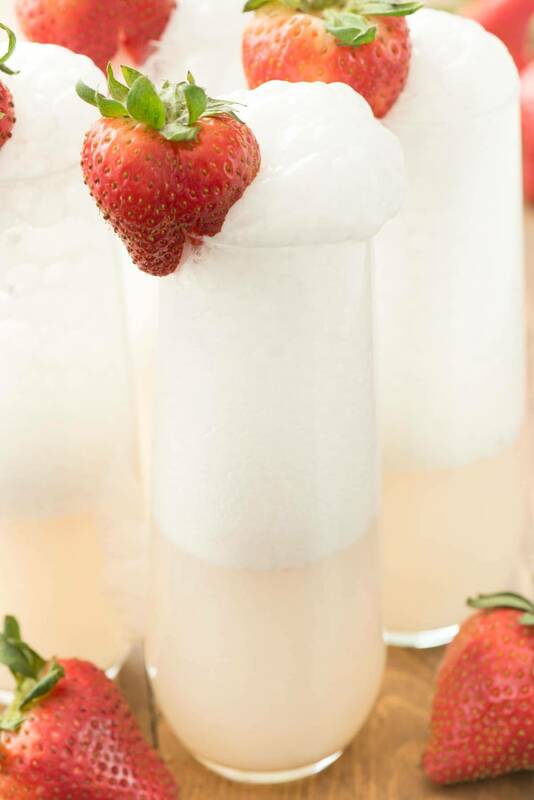 Strawberry Shortcake Mimosa – just three ingredients to the prettiest mimosa recipe ever! 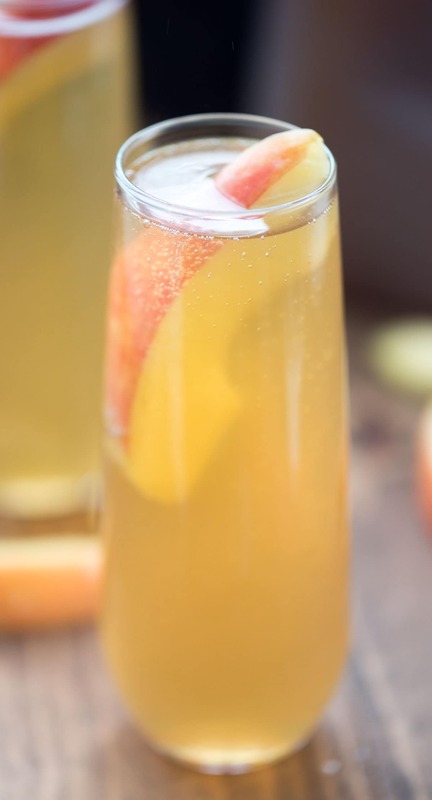 This champagne cocktail is perfect for brunch and can be made as a single cocktail or as a punch! Last week I flew to South Carolina to attend a blogging conference. I got back last night and the jet lag is hitting HARD. It probably didn’t help that I stayed up too late, got up too early and drank too many cocktails for 5 straight days. And then if that wasn’t bad enough, my flight home was at 6am…after I’d been up until 1:00. I think it’s going to take some time to recover from that. I can’t help staying up too late when I’m at blogging events though. I never get to see those friends in person and something about being able to physically talk to someone, as opposed to chatting over messenger, makes you not want to miss a second of anything. Plus…all the free drinks. The conference I attended offered wine at the afternoon snack break. It was the best thing ever because that’s the time you’re so ready to get out of there…but free wine? Sure, I’ll stay and listen for 2 more hours! We joked that mimosas at breakfast would have made it even better…but then I know I would have been asleep for the afternoon sessions. I guess the planners knew what they were doing after all, ha! Speaking of mimosas, Easter is on Sunday and Mother’s Day is coming up quickly…so I think you need a nice new champagne recipe for all your brunches, don’t you agree? How about having a Strawberry Shortcake Mimosa along with your eggs and monkey bread this weekend? I know it’s not quite strawberry season but we’re oh so close. Here in California we can get nice fresh berries all year long but I love them most in spring and summer, when they actually taste like a strawberry. This mimosa incorporates strawberry ice cream or sorbet, so if you can’t find fresh berries you don’t even need them, but they look pretty as a garnish. 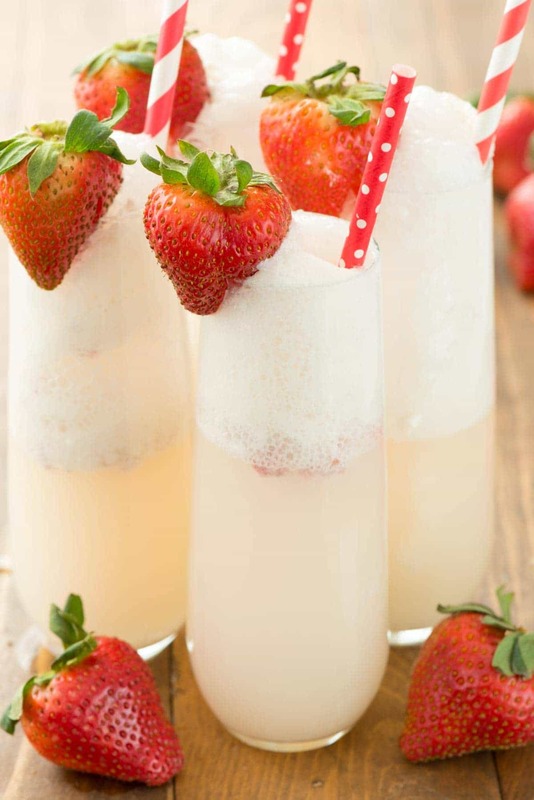 There are only 3 ingredients in this Strawberry Shortcake Mimosa: the strawberry ice cream, champagne (or prosecco), and the secret ingredient: vanilla (or cake) vodka. The flavored vodka adds a little sweetness and extra flavor to the mimosa, making this the perfect strawberry shortcake recipe. And it’s so pretty too, making it perfect for brunch. I really wanted to use strawberry sorbet, like I did in my champagne punch bellinis, but I couldn’t find strawberry. Strawberry ice cream works just as good, but you can also use any sorbet you like. Vanilla vodka is easier to find than cake vodka, but if you have that, use it. It’ll make them taste even more like shortcake. Make one drink for yourself and your mom or make a pitcher for brunch; everyone loves these. And since you’re having a strawberry shortcake mimosa for brunch, why not serve that brunch with some strawberry shortcake treats? Maybe strawberry shortcake scones or strawberry shortcake pancakes?! Strawberry Shortcake Mimosa - just three ingredients to the prettiest mimosa recipe ever! 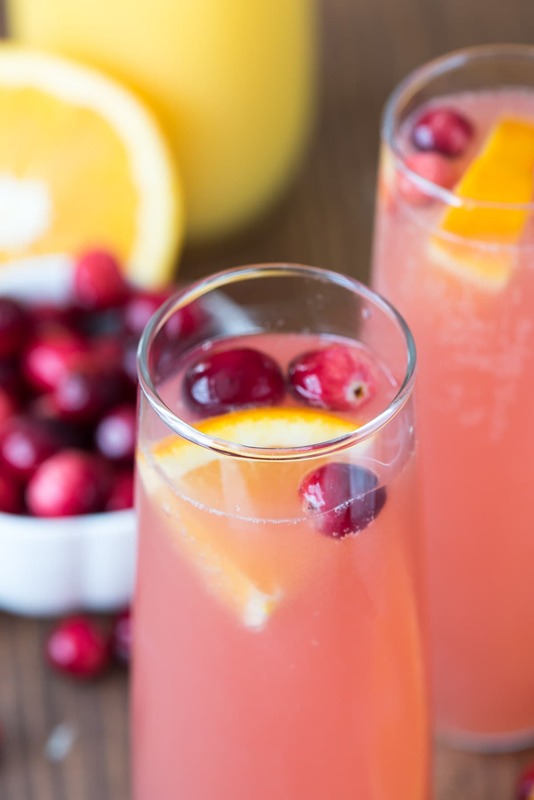 This champagne cocktail is perfect for brunch and can be made as a single cocktail or as a punch! For one mimosa: Place vodka in the bottom of a champagne flute. Add ice cream, then top it off with champagne. Add a strawberry on the side for garnish. For punch: place vodka, ice cream, and champagne in a pitcher. 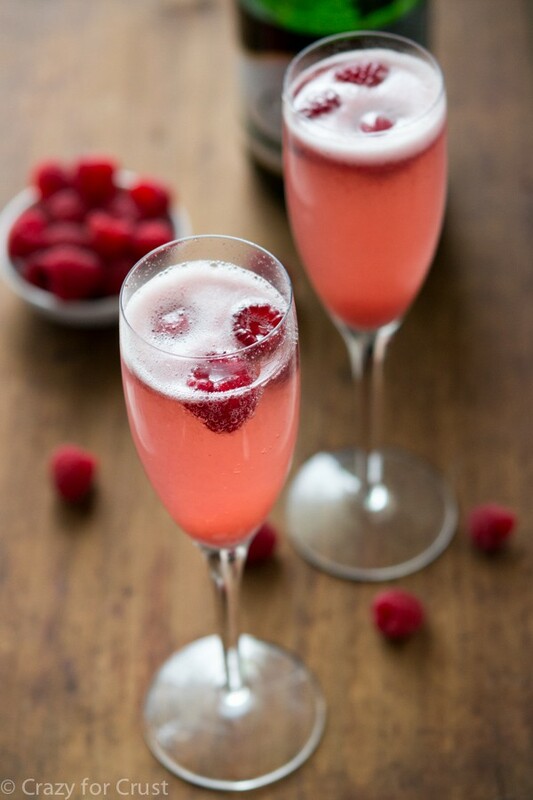 Add berries to champagne flutes for garnish. I think you made this just for me…it is speaking loudly to me! Love it! And yes to seeing everyone in person rather than chatting over messenger and not wanting to miss a second of it. I’m not with MV but I should have just flown to SC to see all of you. It sounds like it was an amazing trip! I bet! I’ll have plenty of champagne when you’re here in May! All the drinks are looking so delicious. LOVE!!!! Thank you for sharing. Please, can you share where you found the glasses for the mimosas?